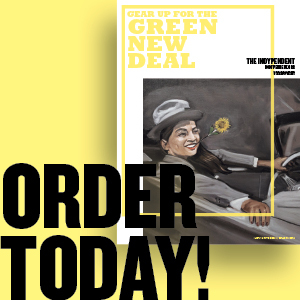 Seeking to further connect the war to domestic issues, Troops Out Now organizers led the march by the Department of Health and Human Resources, the Immigration and Customs Enforcement Agency and the headquarters for the Federal Emergency Management Agency (FEMA). There, several New Orleans residents spoke about conditions more than two years after Hurricane Katrina. “Let it be known that New Orleans is not where it should be,” said Sharon Johnson, a resident and co-founder of the Common Ground Collective which has worked to help rebuild New Orleans’ Lower Ninth Ward. The march returned to the Capitol where more than 75 SDS members sat down in a nearby intersection and vowed to be arrested before they would move. Upon realizing the road was already blocked by the police, they moved their human blockade to the nearby intersection of Constitution Boulevard and Pennsylvania Avenue. Traffic was blocked and police officers started re-routing traffic. “This is about civil disobedience. This is about direct action,” said Daniel Foster of North Carolina State University SDS chapter. Just as politicians were not around the Capitol on the weekend, being late on a Saturday, not much traffic was in the area. The next round of antiwar protests continues on Oct. 27 when United for Peace and Justice convenes regional demonstrations in 11 cities around the country including New York. “ It’s important to protest at the nation’s capital because it has the best chance of making national press, unlike home in Madison, Wisconsin. And this is where the politicians are. When I get back home, I am going to start working with the public access station on antiwar coverage and work with the new SDS chapter that is forming, as well as join the coalition to get our national guard out of the war.” Miles Kristan, University of Wisconsin photo & film student who has taken a semester off to work with the antiwar movement. —Carlos Arredondo, father of Lance Corporal Alexander Scott Arredondo, 20, who was shot and killed by an Iraqi sniper in August 2004. —Miles Kristan, University of Wisconsin photo & film student who has taken a semester off to work with the antiwar movement. 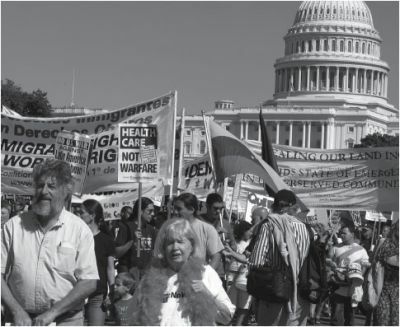 STILL MARCHING: Antiwar protesters gather outside the U.S. Capitol on Sept. 29.